We are anchored in the Florida Keys, which are a long string of islands that extends off the Florida mainland and into the Atlantic Ocean. Specifically, we are anchored off of a small, unpopulated island called Rodriguez Key. It’s warm here and the water is very clear, green and shallow. Today, we took our dinghy on a short ride to civilization: Key Largo (population 10,433). Then, I took a taxi with our two boys into town to buy Halloween costumes and groceries. We are looking forward to spending our first Halloween without winter clothing. With permission, we docked our dinghy outside a restaurant and Tiki bar called the Island Grill at Mandalay. Signage outside the Mandalay Grill and restaurant. 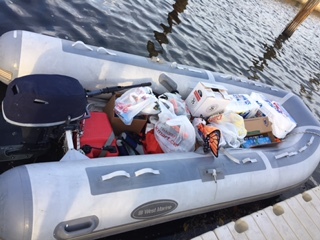 As an aside, here is what our dinghy looked like after it was loaded with my shopping haul. Dinghy loaded with the equivalent of three full grocery carts. 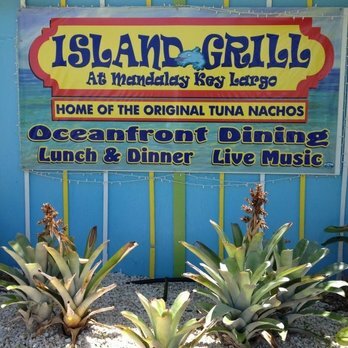 Anyway, in the process of docking we discovered a popular, local phenomenon known as “Customer Appreciation Night” at the Island Grill restaurant. Live music, and free food and drinks! So, sitting dockside, our family of six enjoyed a rare night out. The event attracted hundreds of people – all lined up for burgers, hotdogs, pulled pork, grilled chicken, and various salads, as well as beer, wine and soft drinks. 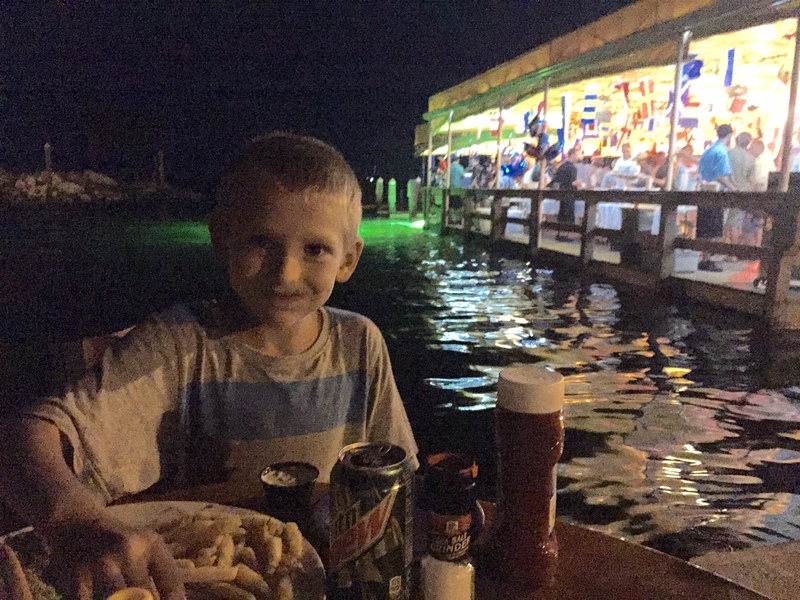 Paul (age 7) enjoys a dockside supper outside the Island Grill at Mandalay, Key Largo. Our kids ran through the crowds with delight, petting random dogs as they went. Karen, in particular, seemed to delight in her new-found freedom. I watched her dance with a very enthusiastic woman. Karen is four years old and weighs only 35 lbs. She was literally swept off her feet. We left by dinghy in the dark. It was a surreal experience to be floating by revellers still drinking at the Tiki bar. Equipped with powerful lights, I may have blinded a few people on shore when I accidentally (but briefly) turned on a flashlight in the wrong direction – facing the crowd. We dinghied back to our floating beds – aboard SV Aphrodite – anchored in the calm, shallow waters outside Rodriguez Key. Sounds like you guys are warm and happy. That’s the one thing we are looking forward to most once we get to Florida. What a great find, don’t you love it when life brings you these surprises.